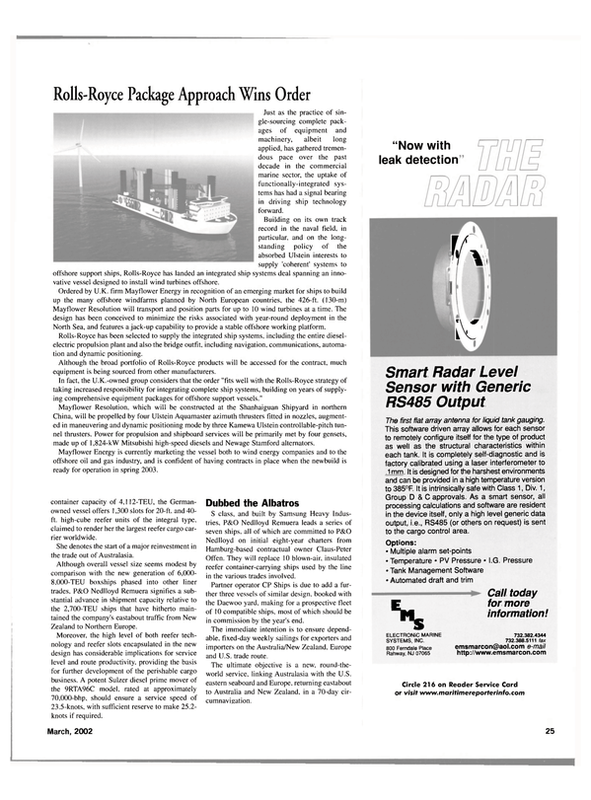 Just as the practice of single- sourcing complete packages of equipment and machinery, albeit long applied, has gathered tremendous pace over the past decade in the commercial marine sector, the uptake of functionally-integrated systems has had a signal bearing in driving ship technology forward. Building on its own track record in the naval field, in particular, and on the longstanding policy of the absorbed Ulstein interests to supply 'coherent' systems to offshore support ships, Rolls-Royce has landed an integrated ship systems deal spanning an innovative vessel designed to install wind turbines offshore. Ordered by U.K. firm Mayflower Energy in recognition of an emerging market for ships to build up the many offshore windfarms planned by North European countries, the 426-ft. (130-m) Mayflower Resolution will transport and position parts for up to 10 wind turbines at a time. The design has been conceived to minimize the risks associated with year-round deployment in the North Sea, and features a jack-up capability to provide a stable offshore working platform. Rolls-Royce has been selected to supply the integrated ship systems, including the entire dieselelectric propulsion plant and also the bridge outfit, including navigation, communications, automation and dynamic positioning. Although the broad portfolio of Rolls-Royce products will be accessed for the contract, much equipment is being sourced from other manufacturers. In fact, the U.K.-owned group considers that the order "fits well with the Rolls-Royce strategy of taking increased responsibility for integrating complete ship systems, building on years of supplying comprehensive equipment packages for offshore support vessels." Mayflower Resolution, which will be constructed at the Shanhaiguan Shipyard in northern China, will be propelled by four Ulstein Aquamaster azimuth thrusters fitted in nozzles, augmented in maneuvering and dynamic positioning mode by three Kamewa Ulstein controllable-pitch tunnel thrusters. Power for propulsion and shipboard services will be primarily met by four gensets, made up of 1,824-kW Mitsubishi high-speed diesels and Newage Stamford alternators.